The backpacker mentality dictates that one shall never use a wheeled bag or else be considered a sell-out. To be honest the idea of giving up a backpack caused much consternation on our parts. We really wanted to keep to the core, with only what could fit upon our backs, with another smaller bag to carry on board. Unfortunately, after considering how long our trip was, and with what we had to bring, and a stroller, plus items for the kid… well, it just wasn’t in the cards. So we caved and started looking for something more practical. We really wanted something that would give us the best of all worlds. 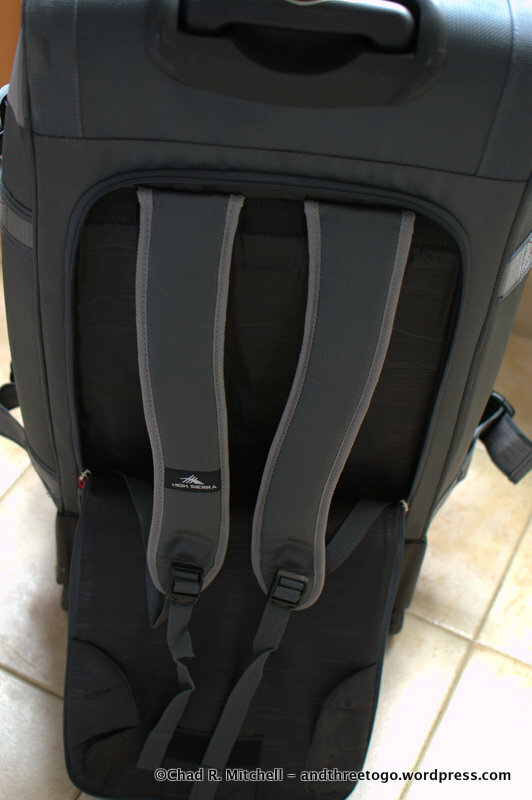 Lots of space, light to carry, durable wheels, and various carry handles. We dreamed of a bag that would have all of this, and then we heard of a couple that had the piece we really missed: Backpack straps. After much searching, shopping and comparing we had almost given up. It seemed the bags available were incredibly expensive and almost experimental. None of them had hardly any reviews, were basically the price of 4 comparable bags without the backpack component. 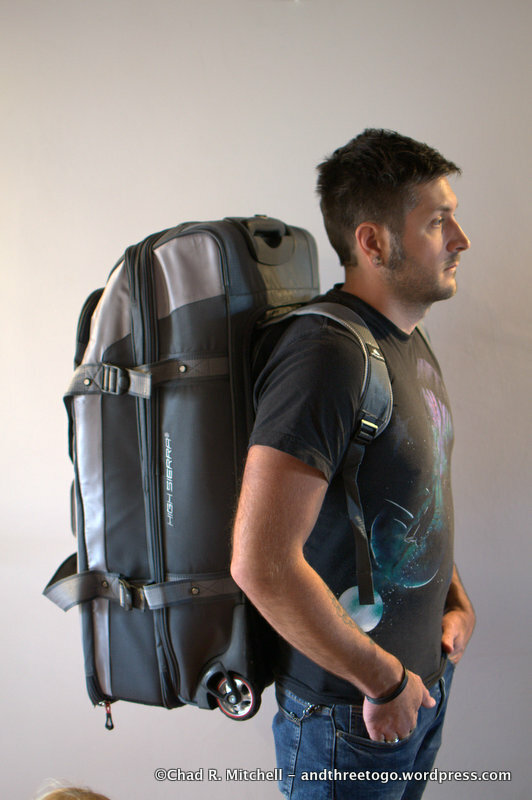 Fortunately we stumbled upon the High Sierra Wheeled Duffel Backpack. A fantastic feat of engineering that was offered at an incredible price. The MSRP listed it at $380 (still a decent savings compared to other bags) but was usually offered on various retailers for less than $150. Even on Sierra’s own site they are currently offering it for a substantially cheaper price than the suggested retail. To start with, the bag offers everything the pricier comparable duffel backpacks offer as well. It even comes in multiple sizes (we went with the AT6 32”) and colors. 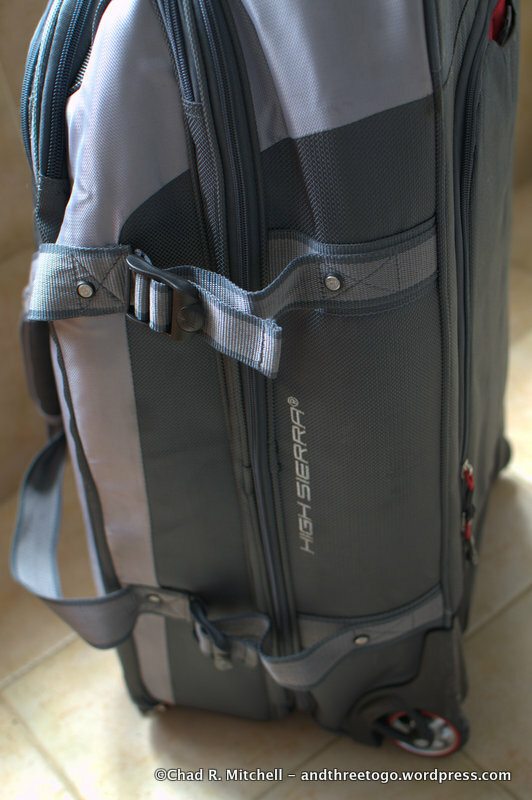 It can operate as a wheeled standing suitcase, with two rollerblade type wheels, and a sturdy retractable handle. Or it can be used as a duffel bag with a well-positioned center grip that is thick and strongly built. And of course, the best part is that there are two backpack straps hidden in the base of the pack, that actually allow it to be worn comfortably as a backpack. The bag is extremely light when empty, coming in at only 11 pounds even with all of its features. It contains two separate chambers in the main pouch, divided by a zippered inner layer. Each one of these can be opened separately from the other from the outside as well, which is really convenient when packing for more than one person in a bag. These combined inner compartments can expand a few inches, during those times when extra space is required, by unzipping two different layers on the side of the bag. A third thin compartment rests along the outside of these two and gives a little more space for smaller items. All of these compartments are contained by two strong seatbelt like straps that can be cinched down to compress the space as tightly as needed. Surprisingly, given the price and features, the quality of the bag is also very durable. The outer layer is made up of a sort of “duraweave” that is light, water resistant, and seemingly stainproof as well. So far none of our travels have even taken a slight toll on the bag, and it is holding up very well. To compare, our other cheaper duffel bag is looking like it went through a war zone, having experienced the same flights. We really cannot recommend this bag enough. Usually we are hesitant to give anything 5 thumbs up but this bag is really phenomenal. Even if it didn’t have the backpack straps, it would be one of the best bags we have ever used. And the really surprising, and appreciated piece is that it comes at such a great price. Even an id tag. It’s the little details. Top of the bag. Duffle. Love the review! This is somewhat of what Hunter thought he was getting for our trip except it weighed a good 50 pounds on its own, or at least so it seemed! Nifty to see the various compartments and how it fits when actually on. Thanks!